Have you ever received a business document, academic letter, legal contract, or other official or formal piece of correspondence, only to find terrible grammar errors and spelling mistakes? What happened to your impression of that company, firm, or agency? If you're like most people, your impression of their reputation probably dropped a notch. You may have even lost some respect for the sender of the correspondence. After all, was the correspondence so unimportant to them that they couldn't even run a decent grammar check program before sending it out? If they don't take their business seriously, then why should you? In a society where face-to-face meetings are kept to a minimum, businesses must rely more and more on how their reputation is casted through the means of business correspondence. The same thing goes for lawyers drafting contracts or government agencies writing reports. The documents released by such organizations directly affect the way in which people will view them. Formal, stately, and well-written documents will receive respect and will be taken seriously by its readers. Sloppy, careless, and poorly written jargon, on the other hand, will likely be ignored. We cannot stress enough how important it is that when you (or your company) compose a letter or other important document, that you review it and proofread it for errors before sending it off. Not only will it make you and your company look unprofessional, but it could literally damage your name, sever business relationships, and serve as an obstacle to closing a deal. So how do you ensure that your business correspondence is well-written with no grammar or spelling mistakes? You'll need to make sure that you run WhiteSmoke's state-of-the-art grammar checking software on every single document that you plan on sending out. WhiteSmoke’s grammar correction software is the best grammar checking program there is available on the market today. The program will correct grammar in any and all types of documents that you may be releasing from your office, including business letters, legal contracts, acceptance letters, letters of reference, and all other written texts. 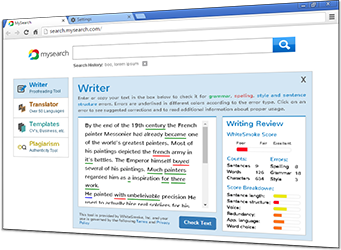 WhiteSmoke's grammar corrector software works by identifying the grammatical errors that are found in your writing. Once identified, the program will give you correction options – as you'll see, for every grammar problem there are usually a number of different solutions! You'll also have the chance to explore the program's free grammar tips and learning opportunities, a tool proven particularly helpful for people who speak English as a Second Language (ESL) or who are translating their native language into English. 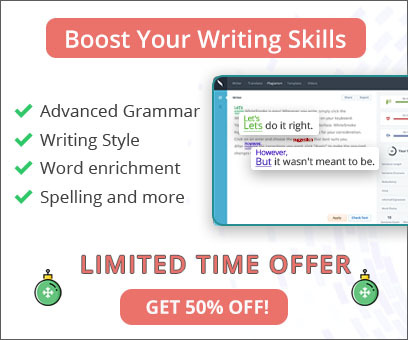 When you buy WhiteSmoke's grammar corrector software program, you will not just be improving your understanding of the English language and improving your writing skills, but you will also be investing in the future of your company.